Like any normal adult I love animated children's films. Brought up on a diet of Studio Ghibli, Disney and Pixar, I never really saw DreamWorks as a major contender for my heart. That is of course until a couple of years ago when my boyfriend recommended How to Train Your Dragon to me. We watched it (because watching it once wasn’t enough for him) and I loved it, I’d say it was one of my favourite animated films. Fast forward to the 12th of July 2014 and I’m in the cinema getting ready to watch How to Train your Dragon 2. Plot wise, the story is solid, unlike like a few DreamWorks sequels in the past, the story doesn’t seem forced and the stakes are raised higher in this one. Also, nice move DreamWorks for aging the characters accordingly. Forget baby faced Hiccup and say hello to 20 year old gangly Hiccup. By getting the characters to move on with their lives since the events of the first film they opened up themselves to a bigger story and a vast new range of character arcs and sub-plots. There are a few unexpected twists, mainly a spoiler that cannot be disclosed, but they were dealt with the same amount of gravitas to be expected in an adult family drama. 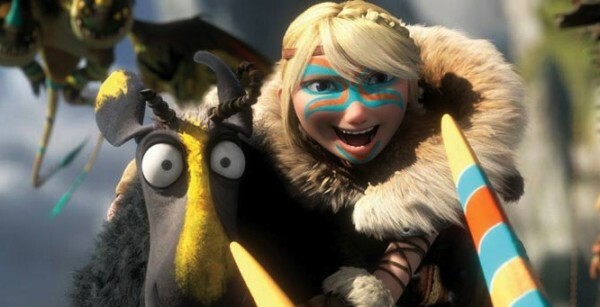 The dialogue itself was just as brilliant as the first film, though they clearly wanted to develop certain characters and their conversations, particularly dialogue between Hiccup (Jay Baruchel) and Astrid (America Ferrea), who share a few coupley moments but also chat together like they’re a realistic couple, something we’re not often treated to in film. The script is loaded with jokes for children and adults alike, as well as lovely moments from the actors improvising. There are also touching moments when we see Stoick (Gerard Butler) re-introduced to his wife, Valka (Cate Blanchett) and… Well, I may have cried. A little. How to Train Your Dragon 2 has also allowed DreamWorks to improve their animation, not that the first film was shabby by any means. It feels that some of the shots, although perfectly animated, were tied tightly to the dramatic story line. However, there were few shots that were there just for the sake of being there. With the film ending with room enough for another sequel I believe that the How to Train Your Dragon series maybe setting itself up to contend with the Toy Story trilogy and DreamWorks has won its way back into my heart. I loved this film and highly recommend it, though naturally seeing the first film would make the experience more enjoyable.